The trip of a lifetime! (January 30-February 9, 2014). This is a unique opportunity to spend Shabbat with the Jewish communities in Guatemala City, meet Fair Trade artisan groups who make beautiful Judaica products, and visit major cultural and historical sites. 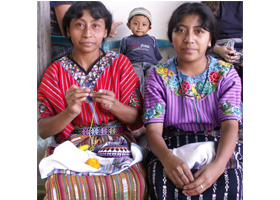 Experience firsthand the positive impact that Fair Trade has on the artisans and their communities. We'll be able to see several new products that were inspired from our first visit (pine needle challah trays, new challah covers, and more). Just a few spots left - SIGN UP now! Sample itinerary, logistics, and info can be found here. 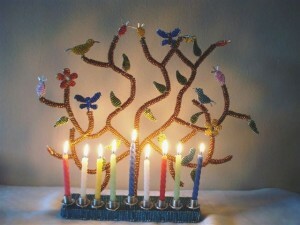 Tu B'shvat, celebrated this year on January 15-16, is the Jewish holiday most connected to environmental issues. Environmental sustainability is one of Fair Trade's key principles - promoting healthy soil, re-use of materials, avoiding dangerous chemicals, etc. 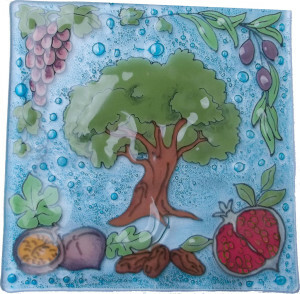 Fair Trade Judaica decided to create a new ritual product: a beautiful Tu B'shvat plate made from recycled glass and decorated with a Tree of Life, olives, grapes, pomegranates, almonds, and figs, using water based paint! So beautiful, this plate can be used year round. Available for sale on our website. You've been asking for an alternative, and we are excited to let you know about a new partnership and opportunity for 2014! Partnering with Equal Exchange and T'ruah your synagogue, religious school, and any Jewish organization can now conduct a fundraising program with fair trade (child labor free) Kosher chocolate! These products also received a Rabbinic psak last year that they can be eaten on Passover if purchased before the holiday begins. Please contact Ilana if you'd like to receive information when it's available in January. Join with over 150 communities commemorating Human Rights Shabbat, a fabulous initiative from our partner, T'ruah, to educate Jewish communities about the intersection of Jewish values and universal human rights. Resources include new liturgy, educational materials, and children's programming.Here's a piece FTJ wrote linking fair trade principles and the Declaration of Human Rights. "A Just Cup of Coffee"
We are pleased to share this blog post, originally given as a sermon at Congregation Beth Sholom in Teaneck, NJ. 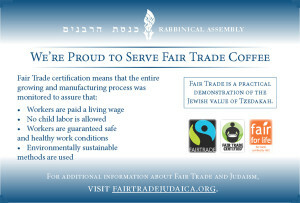 Rabbi Elliot Schoenberg is the Associate Executive Director at the Rabbinical Assembly, and was a strong advocate for their 2012 resolution promoting fair trade.